WILLEMSTAD – The Dutch newspaper Antilliaans Dagblad gave a good explanation about the history of the concession agreement between the government and the Curacao Ports Services. The public company Curaçao Ports Authority (CPA) was established in 1981 for the operation and management of all Curaçao ports. CPA owns the ports and the (im) movable properties. 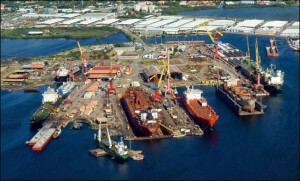 In the concession agreement of May 1995, CPA granted the exclusive right to the private company Curaçao Port Services (CPS) to carry out stevedoring work in the ports and did the same to the private company Antillean General Transport (AGT) to handle containers and goods in the ports; that applies to the current port as well as possible future ports. During later negotiations, it was not possible to persuade CPS / AGT to leave the question of the future ports out since CPS / AGT continued to rely on already written agreements with the Executive Council of Curaçao. It was specifically about the existing ports e.g. the Brion Yards, Container Terminal, Ferry Terminal, and yards and docks at St. Anna Bay, Waaigat and Schottegat which belong to CPA. The first concession was from August 1991 until the end of July 2001 and “will” be extended each time for a period of 10 years. The word “will” instead of e.g. “can” turned out to be essential; CPS continued to rely on it every time. The concession agreement was for a long time a confidential (or secret) document, because it was until the year 2000 that it was decided to give a copy to all the members of the Supervisory Board (SB). In subsequent negotiations with CPS / AGT, it was about a link between the duration of the concession, the concession fee and the amount of investment made by CPS; but also that the adaptation of the concession should 'not' lead to rate increases for customers of CPA and CPS; that there should be encouragement of a regional transfer function for the Curaçao harbor; and also to find a structural solution with AGT for the so called chassis problem (the lack of chassis for the transport of containers in peak periods). In May 2011 a motion was passed by the Parliament of Curaçao (12 of the 21 votes in favor) which advocated for an end to the exclusive rights of the CPS. The CPS management did not respond. Pueblo Soberano (PS) frontman, Helmin Wiels argued that the monopoly should be abolished at the end of July 2011, that there were several other interested parties to do stevedoring operations and that it would be now priority to get the best deal for Curacao. In March 2012, however, the (then extra-parliamentary) opposition noted that CPS still had a monopoly and PAIS challenged PS leader Wiels to act in reference to his own statements made a year earlier, that the people of Curacao were struggling under the monopoly in the harbor. According to PAIS leader, Alex Rosaria, there were "elements within PS that support the monopoly." As of mid-2012, there were negotiations taking place with CPS and the CPA informed the government in late July on, among other things, about the expiration of the exclusivity of stevedoring work. CPS got a concession period of 20 years, with the possibility of extension for another 20 years, and should also invest in container terminals and cranes and in the (preventive) maintenance. There was a different Supervisory Board back then, with representatives of the political party MFK, headed by the former Prime Minister Gerrit Schotte. As far as the current Supervisory Board goes, the concession of September 2012 will be reversed in the interests of maintaining the certification of the port and in the interest of Curaçao.